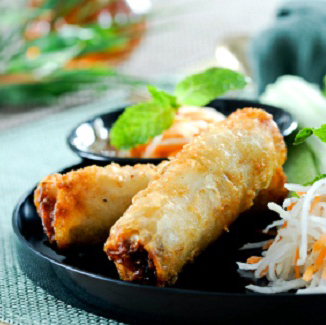 One of the most popular traditional dishes in Vietnam, suited to any occasion, are the spring rolls. Vietnamese culture recognizes over 20 different kinds of spring rolls. Many of us which love Vietnamese crispy spring rolls tried to make them at home. The recipe for “Nem Ran” “Cha Gio” is really easy, but depending on the province it is served in, can vary slightly. Nem Ran in Ha Noi are served with thin rice noodles called Bun, with fresh vegetables and herbs including cilantro, perilla, soy sprouts, and elsholtzia, as well as fish sauce with chili peppers and garlic. Here is a recipe for those spring rolls, which are a favorite of many. 100g thin rice noodles "Oh Ricey!" Immerse the black mushrooms in hot water for 30 minutes to soak up some water, then strain them and cut them into little pieces. Submerge the thin rice noodles in warm water for 10 minutes, strain and let them dry. Then, cut them into 3-5 cm length pieces. Cut the Shallots, carrot and garlic into small pieces and add them with the mushrooms into the noodles. Then, add 2 eggs into the mixture, a pinch of salt, black pepper, and a teaspoon of fish sauce. Mix everything thoroughly. Lay the rice paper on a flat surface, and lightly wet it all over with water. Take a little bit of the mixture we prepared and place it on the paper, then wrap it into a roll as shown. Repeat this process until we use up all our prepared mixture and rice paper. Take the prepared rolls and fry in oil for roughly 3-5 minutes, until they are a beautiful golden-brown on all sides. To prepare the sauce, mix 5 teaspoons of sugar and mix them into 100ml of water. Add 2 teaspoons of fish sauce, garlic cut into small pieces and 2 chili peppers. The rolls are done, we can eat them while dipping them in our prepared sauce. Here is a video example of how to make the Nem Ran like in Northern Vietnam.